Not even the Black Wings can kill the spirit of Christmas! Help decorate a tree in defiance of the Black Mage and be awarded with gifts! Find Little Beak in any major town to enter the event. 1. Collect Tree Ornaments by killing mobs. 2. 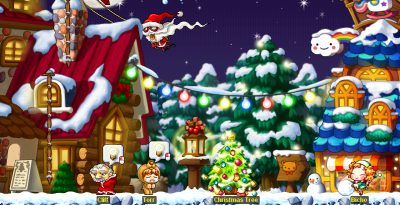 Take the ornaments to NPC Little Beak, who will then take you to White Christmas Hill. 3. Give your ornaments to NPC Black-nosed Fur. When Black-nosed Fur has enough ornaments, the tree behind him will begin to be decorated until it can hold no more and explode into a flurry of Snow Crystals. 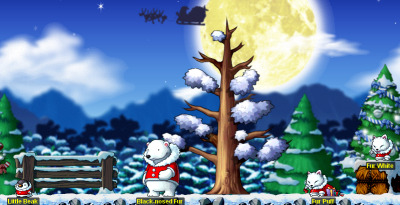 Collect as many Snow Crystals as you can and trade them for items with NPC Fur Puff or NPC Fur White. Don't forget, sharing is caring! A Lucky few of you will also pick up Golden Snow Crystals, which can be traded for rare items! The Festival of Lights is all about celebrating freedom and it's never been more appropriate than right now! Enjoy all your favorite holiday events including the Quest for Torr's Horn! Happyville was overran by Grinch and we don't want him stopping us from having fun! We have decided to relocated to the other side of town, Extra Frosty Snow Zone. In order to start the questline, you must speak to PaperBoy in Lith Harbor. Mazel Tov! It's the season of giving! Not all presents are just simply given away for free. We will be running a Christmas Tree Decoration contest! The best decorated trees will be gifted the greatest prizes! With a contest comes rules and regulations. You must abide by these rules for the entry to be accepted. Maximum amount of people allowed per entry: 3. Each must be present in the photo. Each person can only participate in one submission. They will be disqualified if they have multiple entries. This applies to mule accounts / characters. However, those who participated along side such a user will still have the opportunity to win! The screenshot must be in 1024x768 resolution. It must be a full screenshot. Private message Taboo with your screenshot and participants IGNs to submit your entry. Now for the exciting part, rewards! We will review all submissions and vote for the top 3 trees. Q: How do I prevent my items from being stolen when I start decorating a tree? A: There is special code set in place where you are not able to loot any other players items while inside the tree decorating maps. Q: What happens to my items if I disconnect? A: All items will be sent back to your inventory. You do not have to worry about losing items. Q: How long do I have before my items expire? A: Items will not expire in this map. They will only be removed from the floor when you exit the map. Do NOT exit if you're not done. You will have to redo all your work! Q: Can I drop any item? A: You cannot drop untradable, or 1-of-a-kind objects in there, or CS items. Q: There is a person that keeps following my group and griefing our tree / picture. How can we get rid of them? A: If there is a person following you around, please report the user to Taboo. They will be disqualified from the contest and may possibly be banned. Q: How will the trees be judged? A: We will judge the trees on overall creativity and theme. Q: Can I enter in both v92 and v100? A: Of course! You will not be disqualified for participating in both. Spoiler: Here are two examples! Santa will be bringing goodies for all the boys and girls! Is "we" referring to the staff and a select few, or will the Croosade community be voting for the top 3? Any idea on how many ornaments are needed to max out the tree? Rooney now allows access "Happyville" (Extra Frosty Snow Zone). Sorry about the issues earlier! Less than before the restart. Sorry we've set a stern limit at 3. We decided to move Little Beak into Frosty Zone to avoid confusion on what to do with decorations. I saw many people not understanding what was going on. Also, the Polaroid for the picture Cliff requests can be obtained by talking to the NPC Happy. knitting ball can do what ? Is it an individual event whereby the tree only counts your contributions and then explode into snow crystals once a number is reached, or is it a server-wide cumulative effort where it counts contributions from everyone? Its a server wide thing. per channel. So after donating my ornaments, I have to wait at the place till it is sufficient and burst before I can collect anything? And the looting process is also a free for all? Instead of ensuring everyone gets at least one or something for contributing. You can farm enough to burst the tree for yourself, it’s a set amount each time. But if you don’t have enough then you will have to wait for the tree to burst through others contribution. As they said on the first post, sharing is caring!